My goodness.. it’ been such a long time since I last posted! I feel guilty that I haven’t kept my reader’s up with all the little things that have happened since I wrote about Murphy’s passing. February 14th Oreo finally gave birth to twins… Valentina & Valentino were born without any help from me. I showed up for morning feeding and “voila” two extra little mouths to feed! Tina was mostly black, the typical Pygmy goat coloring with gray muzzle & ears while Tino is a solid, solid jet black. Not one white hair anywhere! He is a darling! I have since sold Tina and kept Tino – not sure if I’m going to keep him, castrate him or sell him… I’m on the line with this one because I think he’ll end up being a bit taller than my current stud. Flip is very small & compact and since I’m trying to breed small, he’s just perfect! We’ll see. If the right buyer comes along, I just might let him go. At this moment my rabbit has 4 little bunnies. This is her 3rd litter since I’ve had her but all the bunnies from the 2 previous litters died within the first 48 hours. These little guys born Saturday the 18th are squirmy and very much alive. Of course it’s much warmer these days than it was when she birthed earlier this year. I’m anxious to see what the little ones will look like. Flopsy is a gray Lop Ear and the buck is a solid black Lionhead. They should be very cute. I also have two hens that have hatched 7 chicks. They’re so funny… they have their boxes side by side in a large cage (to keep them safe from Possums & feral cats), and they keep stealing each other’s chicks! Strange thing is that hens can be really mean to the chicks… they often peck at one chick in particular and often times wound them mortally. 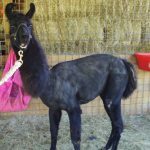 Stormy my goat loving Llama (referred here as “Uncle Stormy”), w as sheared on Saturday. He looks like a different animal altogether! I think he’s not too happy with his looks as he’s been keeping pretty much to himself inside his stall. Maybe he’s cold? Could be… all of his wool is gone! Note that this wasn’t a “show” trim but just a plain old shearing – no fancy cuts! In a few weeks he’ll have some growth & he won’t look so strange! About a month ago I bought another miniature horse… named Cowgirl. She’s a caramel color with blond mane & tail and came with a cute little wooden cart. I renamed her “Ol Blue because of her beautiful marble blue eyes and the fact that she’s at least 20 years old! I was able to drive her but realized that the cart (and me! ), was way too heavy for her to pull comfortably so I bought a little “Easy Entry Cart”. She does much, much better with it but it still is difficult for her on these hilly roads. Saturday (April 18), I had my petting farm set up in town and drove Ol Blue all the way into town with Toffee tied behind me. It took us about 45 minutes to get there… it’s a 5 minute drive in the car! She did well on & off… she tires easily and I don’t want to overdo it with her. So now I’m shopping for a younger horse! Ol Blue is a very gentle horse and very well mannered. I hope that my farm will be her last… she’s such a good horse – she deserves a final home here! So, final count, I have 6 adult does 4 of which I’m sure at are pregnant and should kid end of May, beginning June. That would be Noelle, Chausette, Brownie & Blackie. I don’t think Old Goat is pregnant (she may never be), and Oreo isn’t yet… Molly my fainting goat looks pregnant but I can’t tell for sure yet. She & Bambi would also be due end of May. My young little Cocoa looks like she’s about to pop a kid any day now & I have to keep a close watch on her. She’s way too young to be birthing but she came to me that way in January. I have several kids for sale at this time and you will find their pictures/videos on my “For Sale” page.